What Does Your Stuff Mean? While I can’t exactly blame Socrates for my tendency to seek meaning in even the most minute details of life, he provided me with a philosophical excuse to do so when he said: “The unexamined life is not worth living for a human being.” Recently, I’ve been thinking a lot about stuff and things – literally. I am fascinated by our relationship to the objects that surround us, whether it’s nurturing some kind of a collection, or choosing a reduced, even ascetic, way of living. In the process of this soul searching, I’m finding that a lot of collectors and minimalists actually have more in common than I realized. In response to the threats of growing consumerism, advocacy for minimized living is a popular topic among bloggers, life coaches and journalists. A few months ago, entrepreneur Graham Hill wrote an opinion piece for The New York Times about his journey from excess to simplicity. A hotly debated article, it resonated with some and was panned by others, with Richard Kim of The Nation going so far as to call it “a majestic display of guileless narcissism.” The trouble with some of the advice urging us to simplify and reduce is that the process of having less can become just as needlessly competitive and aspirational as the pursuit and accumulation of more. Whether filling life with stuff or striving for minimalism, it’s important to first acknowledge our intellectual and emotional connection to objects. Getting rid of some belongings without a little bit of soul searching won’t always lead to somehow feeling lighter. Just think about the invisible accumulation that is a very new symptom of the times we live in: digital clutter rules our lives a lot more, but because it isn’t as prominent or tangible, it’s a way of expression that doesn’t get examined as frequently. Material possessions are often a symptom of some personal urge and narrative begging to be shared, and it’s something that exists globally. Photo essays like Carlo Gianferro’s look into the homes of Roma families or residents of Mozambique, or Gabriele Galimberti’s portraits of children from across the globe displaying their favorite toys, serve as a vivid reminder of the economic disparity that exists when it comes to possessions. These photos also provide a glimpse into a very complex but fascinating human need for expression through belongings. Personally, I am more similar to those who consider their collections of books, antiques, and mementos a textured, multi-faceted expression of the inner workings of their minds. An artist friend views life as an ongoing treasure hunt, his home becoming a tangible and visual extension of his personality, something that can be shared with visitors. 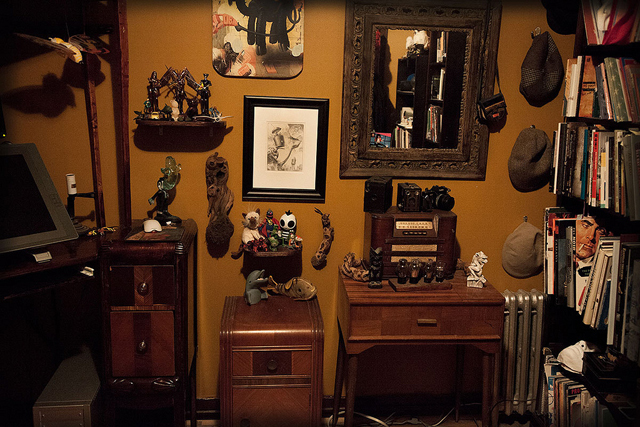 Similarly, another considers the many items that fill his home as an outward expression of his curiosity and joy. Aesthetically, we share an appreciation for hobbit holes, Joseph Cornell’s installations, and Rebecca Purcell’s interior design. I like to think of it as artful clutter, the kind that breathes and feels warm to the touch. In her book Bird by Bird, Anne Lamott noted, “Clutter and mess show us that life is being lived.” Her words aren’t meant as an excuse for being untidy but rather echo that same sentiment, that every little thing around us has a narrative. There are some that embrace that philosophy quite literally – salvaging stories that can be found in objects many would relegate to a trash heap – like the folks behind The House of Collection or the curators of Museum, both based in New York. Those who appreciate a more pared down approach, however, aren’t somehow less expressive. Everyone I know who favors clean lines and simplicity treats personal space as a backdrop against which carefully chosen works of art or special items can stand out. An art buyer I’m friends with is absolutely obsessed with objects, but holds out for the really special stuff that can shine brighter. Knowing that there are people creating beautiful, expressive things is enough for her. Similarly, a nomadic hacker buddy of mine feels that having fewer things makes you more agile and flexible. Having moved across the country multiple times over the years, he has gone from needing a jumbo moving truck to being able to fit everything he owns in the back seat and trunk of a Buick sedan. The only things he’s not willing to sacrifice? A growing collection of artworks and a carefully selected assortment of suits. Speaking of which, a great example of the thoughtful minimalist is attorney Harvey Specter on USA’s TV series Suits. Played by Gabriel Macht, Specter is impeccably put together in Tom Ford and spends a lot of time in his equally immaculate office, where also stands a loving displayed wall of vintage soul and jazz LPs. Whether converting personal libraries to electronic files to store in the cloud, or putting together yet another shelving unit to display art monographs and vintage knick-knacks, I’m finding that there is more than one way to express our relationship with objects as an extension of self. While I might feel a sense of home in a room with wall-to-wall bookcases and soft armchairs, it’s fascinating to consider the different ways we all build up our environments. Zen websites urging us to declutter, or home decoration Pinterest boards rife with catalog-perfect images aren’t meant to be rigid rulebooks. Whether adding or subtracting, there is no right or wrong way to do it, as long as it comes from a place of contemplation and curiosity. Bearing that in mind can give us a new way to understand and accept ourselves, and it can provide a fresh perspective on the homes and personal spaces of everyone we encounter.